A music demo, or simply a demo, is a sample recording of your music. Usually, demos are rough recordings of songs and often do not include an entire album's worth of material. Demos are frequently sent by bands to record labels to try and land a deal, but they have a few other uses as well. 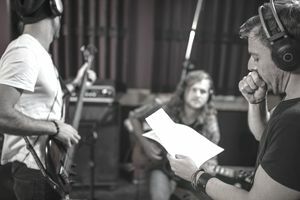 Demos of new songs can be given to producers before a band goes into the studio. The songwriter in a band may give rough demos of new songs to other band members. If a band or artist is looking for an agent or manager, the demo is a key tool to raise interest. And sometimes, a record label will allow the media to hear demo recordings to build some buzz around an upcoming release. When this does happen, usually only a select few media members will get to hear the demos, and generally, this happens when demos contain "finished" songs. In other words, songs that are still in the writing and tweaking stage don't often get played for people outside the band and label. One of the most important things to remember about a demo, especially when you are getting started, is that it is not intended to be a finished product. There is no need to spend a lot of money in a recording studio to make a demo. Labels expect your demo to be rough, and no one is going to give you a record deal (or turn you down) based on the recording quality of your demo. Also, remember that a demo should be short. It should contain your best songs; three or four is ideal. Demos offer a taste of your music, not your whole catalog. What's more, when a label receives a demo with studio recorded songs, it may indicate the artist is naive about the way the music industry works. Despite your best intentions, this approach could raise questions about whether or not you're ready to undertake the humbling process of trying to get a music career off the ground. Spending money on a polished demo is not worth the investment, and may end up hurting your chances more than helping. A label has to be interested your kind of music to have any interest in releasing your record, so make sure you investigate the labels that you approach with your music. If your band has a sound like Metallica, for instance, don't send your demo to recording labels that work exclusively with hip-hop groups. The worst thing you can do is send out a demo blindly. A lot of recording labels have very specific rules about demos that you have to follow if you want to make it through the door. Some require you to get permission to send a demo in the first place. Consider that unsolicited demos could get a label in legal trouble. If they're not careful, someone could claim that the label ripped off the song form the demo. Demo policies can usually be found on label websites. Respect the rules. A demo doesn't have to be long and drawn out to be effective. Rather, it should be a sample of your work. The goal is to give whoever it is you're trying to reach a taste, so they come asking for more.